Did you know that fertility issues affect up to 15% of couples? So if you are one of those couples that is trying to create a family and are experience some setbacks, don’t worry. First, listen to your heart and believe that all that is right for you will eventually come your way. Your stork is on the way, one way or another. Luckily, there are a few natural ways to help the stork and increase your fertility and become pregnant faster. You would be surprised to hear that there is something you can do about it today! Diet and lifestyle changes can help boost fertility by up to 69%! Do you hear the storks feathers swirling in the mids of the wind already? Antioxidants like folate and zinc may improve fertility for both men and women. Antioxidants deactivate the free radicals in your body, which can damage both sperm and egg cells. One study of young, adult men found that eating 75 grams of antioxidant-rich walnuts per day improved sperm quality. Another study that followed 60 couples undergoing in-vitro fertilization found that taking an antioxidant supplement resulted in a 23% greater chance of conception. Foods such as fruits, vegetables, nuts and grains are packed full of beneficial antioxidants like vitamins C and E, folate, beta-carotene and lutein. Eating a substantial breakfast may help women with fertility problems. One study found that eating a larger breakfast may improve the hormonal effects of polycystic ovary syndrome (PCOS), a major cause of infertility. For average weight women with PCOS, eating most of their calories at breakfast reduced insulin levels by 8% and testosterone levels by 50%. High levels of either can contribute to infertility. In addition, these women ovulated 30% more than women who ate a smaller breakfast and larger dinner, suggesting improved fertility. However, it's important to note that increasing the size of your breakfast without reducing the size of your evening meal is likely to lead to weight gain. Eating healthy fat every day is important for boosting fertility. Trans fats are commonly found in hydrogenated vegetable oils and are usually present in some margarine, fried foods, processed products and baked goods. A large observational study found that a diet higher in trans fats and lower in unsaturated fats was linked to infertility. Choosing trans fats instead of monounsaturated fats may increase the risk of ovulatory infertility by 31%. Eating trans fats instead of carbs may increase this risk by 73%. Too tehnical? Let’s try it this way .. Since we know how overwhelming can it get sometimes, we created a simple pamflet which you can find below and simply take a screenshot of it and whenever you are in a store, just make sure you load your cart with the ingredients listed below and try to stay away from the list on the bottom. 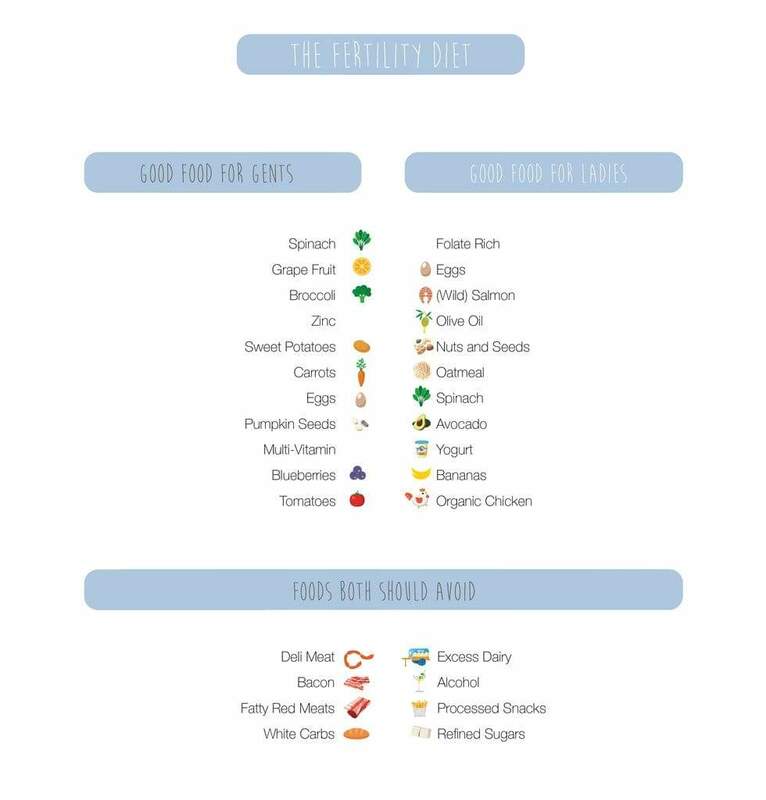 If you want to take it up a notch, please contact us at contact@blusbabyboutique.com and we will be happy to share a full size document with you that you can print out and have on a fridge for constant reminder your baby is one meal away. And happy storking!